Kent all-rounder Matt Coles has signed a new long-term contract with the club. 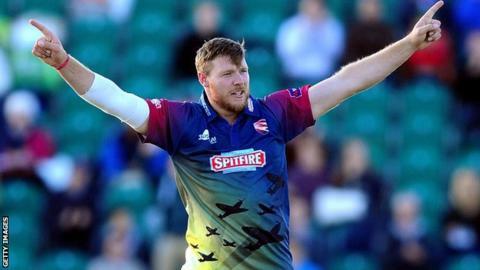 The 25-year-old, who rejoined Kent in March after a year with Hampshire, has taken 54 Championship wickets at an average of 22.05 this season. "It is something I think was inevitable really," Coles, who came through the club's academy, told BBC Radio Kent. "Coming back, I was excited and I have not done too badly so far this year. It shows that this is home and home is where I should really be." Coles played for England Lions in 2012 and 2013 but has not featured for the side since being sent home from their tour of Australia in 2013 for disciplinary reasons. He hopes his form at Canterbury will allow him to get international recognition again in the future. "I'd love to be back there where I was, however long ago it was," Coles said. "Time will tell, I guess. It is up to them at the end of the day if they feel I have deserved it or not. "I will keep doing my job for Kent and go from there."